The Outlaws Is Coming (stylized as The Outlaws IS Coming!) is the sixth and final theatrical feature film starring The Three Stooges after their 1959 resurgence in popularity. By this time, the trio consisted of Moe Howard, Larry Fine, and Joe DeRita (dubbed "Curly Joe"). Like its predecessor, The Three Stooges Go Around the World in a Daze, the film was co-written, produced and directed by Moe's son-in-law, Norman Maurer. The supporting cast features Adam West, Nancy Kovack, and Emil Sitka, the latter in three roles. In 1871, Rance Roden (Don Lamond) plans to kill off all the buffalo and thus cause the Indians to riot. After they destroy the U.S. Cavalry (his real enemy), Rance and his gang will take over the West. Meanwhile, a Boston magazine gets wind of the buffalo slaughter and sends editor Kenneth Cabot (Adam West) and his associates (Moe, Larry and Curly Joe) to Casper, Wyoming to investigate. Once there, Ken's shooting skills (secretly aided by sharp shooter Annie Oakley (Nancy Kovack) earn him the job of town sheriff. Rance has his band of bad guys called in to have the lawmen wiped out, but the Stooges sneak into the gang's hideout while the gang is asleep and glue their firearms to their holsters. When Ken confronts the bad guys, the bad guys decide that a life of justice is better than crime. Meanwhile, Rance and Trigger attempt to sell firearms to the Indians, including an armored wagon containing a Gatling Gun and cannon in a turret, but the Stooges foil this plan by snapping a picture of them making the sale. Upon release of The Outlaws IS Coming, a number of English teachers expressed displeasure over the movie's grammatically incorrect title. The title itself was a satire of Alfred Hitchcock's 1963 film The Birds, which featured the tagline "The Birds is Coming". The film satirises many 1960's fads, films and television commercials as well as the Western. In a nod to television's key role in the resurgence of the Stooges' popularity, the outlaw characters featured in the film were played by local TV hosts from across the U.S. whose shows featured the trio's old Columbia shorts. “ The Outlaws IS Coming. What a wonderful experience! Our first meeting at the Columbia ranch, one morning quite early, and I went in to makeup and got on my western duds and came out in the street. And I saw Larry Fine sitting in a chair and I think his wife was yelling at him about something. Actually, the guys were very serious off camera, their demeanors. They were very serious artists in their own way and I was surprised how quiet they were in respect to their screen personae. I think the funniest little incident of the picture that I remember, the main thrust of the plot was that we were trying to save the buffalo and I was the young lawyer from Boston and we had the same interests and that's how we got together. So we spent the movie trying to save the buffalo. The wrap party at the end of the movie and Moe says, 'Ok, everyone's invited to my place in Bel Air for a buffalo barbecue!' And that sort of typifies these three restless knights. I never really spent much time with them away from the set. People don't do that often in Hollywood, you know, you're doing a series and you spend eighteen hours a day with people and you just kind of want to get away from them, it's probably more helpful that way. I wanted to go home with the Stooges every night, but they wouldn't let me! 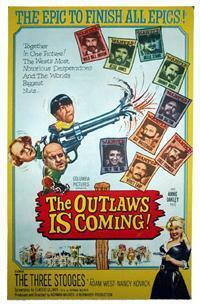 Following The Outlaws IS Coming, the team made no more theatrical film appearances. They did voice the animated cartoon series The New Three Stooges and star on-screen in live-action sequences for the series. This was followed by an appearance in the promotional short Star Spangled Salesman (as part of an all-star cast). Lastly, they made Kook's Tour, a television pilot that was disrupted when Larry Fine suffered a stroke during production and was later released to the film collectors home-market. ^ Solomon, Jon (2002). The Complete Three Stooges: The Official Filmography and Three Stooges Companion. Comedy III Productions, Inc. pp. 546–549. ISBN 0-9711868-0-4. ^ Pyatte, Steve (2005). Harlow Hickenlooper: Introducing Hal Fryar Archived 2008-11-20 at the Wayback Machine. Retrieved on 29 December 2009. This page was last edited on 20 April 2019, at 09:57 (UTC).